Target Northern Campus (TNC) is located 15 miles northwest of downtown Minneapolis. The campus is comprised of 6 connected buildings totaling over 1 million sq. ft. and host to productDNA! For parking, please look for signs for Guest Parking. This is on the west side of the campus. Non-Target team members will also need to show a government-issued photo ID to attend the conference due to Target Corporate Security policies. Bon Appetit operates our on-site cafeteria. You can see the menu and dietary options here. There is a Starbucks within TNC that is open throughout the day. Please note that while you can earn rewards, you can not redeem them at this location. 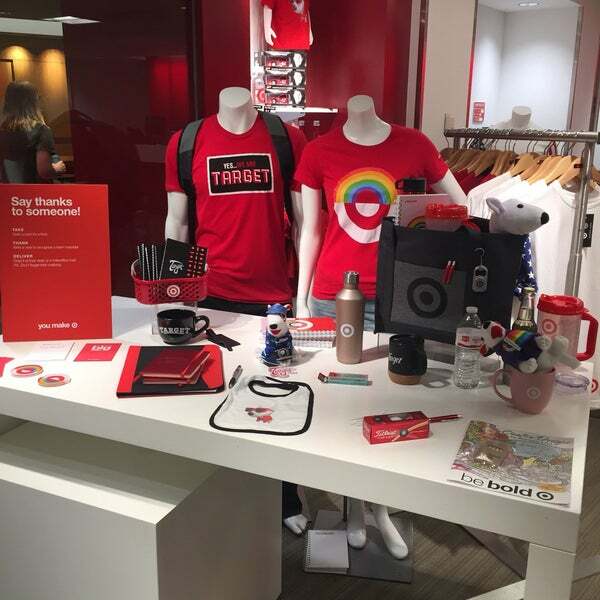 Check out some Target merchandise that is only available within Target HQ Locations including Target shirts, dogs, and more. Just like our stores, Target Guest Wi-Fi available throughout campus. For the comfort and convenience of people traveling from out of town a limited number of rooms have been reserved from June 17-21 at a special rate for two local hotels, the Hampton Inn and Home2 Suites. The hotels are adjacent to each other and are a very short distance to the Target Northern Campus where productDNA and Product Training is being held. A special rate of $122/night is available until May 30th, 2019. Complimentary hotel shuttle service to and from Target Northern Campus will be available. The shuttle seats a maximum of 14 people, so multiple trips will be required. Check-in time is 3:00PM and standard check-out time is 12:00PM. Cancellations must be made (48) hours prior to arrival. Reservations can be made by clicking the registration links below for each hotel or calling and asking for the room blocks under "Target - productDNA Conference". Please note that there is an alert saying “The hotel is filling up quickly” on the landing page. Do not worry, we have enough rooms! This message is because of our room block taking up most of the rooms in the hotels. There are a lot of great food choices around Minneapolis, but wanted to provide some of our favorites that are close by. Relaxed steakhouse offering wood-grilled beef, burgers & seafood, with a bar & outdoor seating. Stylish, colorful eatery offering Thai dishes as well as sushi, beer, wine & a happy hour menu. Casual spot with a varied American menu, a full bar with a large craft beer list & Sunday brunch. Target's dress code is referred to as "Dress for your Day". This means dress for what is appropriate for your work day. For productDNA, this most like means some nice jeans and a nice polo or button up shirt. If you feel like it, feel free to class it up! If you want to sport red and khaki, we will not stop you! No heavily worn shoes, rubber flip flops, or Birkenstock-style sandals. No clothing with potentially offensive graphics or words. No shorts, overalls or jogging suits. No hats or caps, unless medically necessary. No leggings unless worn with an appropriate length dress, skirt or top. No halter tops, sheer or revealing clothing (e.g., bare midriffs, short miniskirts, tube tops). No spaghetti-strap tops or dresses unless covered by a jacket or sweater. © 2014 Based on Project Zeppelin. Designed and created by Jeremy Moede.